From either north or south-bound I-15, ​ you’ll TAKE EXIT 275. Follow Pleasant Grove Blvd - it will curve a bit. At STATE STREET, TURN RIGHT. 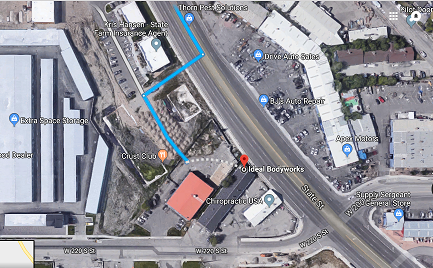 Go about 0.3 mile and TURN RIGHT at the second entrance of the MAJESTIC MEADOWS business plaza. Once you are in the parking lot, take the FIRST LEFT. Go until the parking lot ends. We are in the long building. Our door faces state street. For reference, the Swim Kids Sign on state street street marks our parking lot where you need to park.